STATUS : Login Registration Booking Payment Done! If you're having difficulties logging in, please clear your browser cookies and try to login again. What is StarSearch Online? It is simply the best way to reach a widespread audience if you want to utilise the far-reaching sweep of the Internet in tandem with The Star's million-plus readers daily to advertise your wares/services. 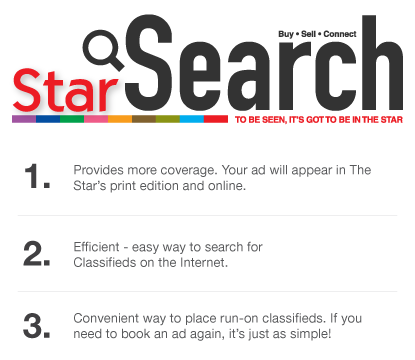 The StarSearch Online is designed for the convenience of individuals who wish to place classified advertisements in The Star anytime, anywhere. The only requirements are that you have access to an Internet-connected computer and any MasterCard or VISA credit card . For the time being, this is the only acceptable mode of payment. In the future or as the market dictates, we will add other payment modes.Click Here for FAQ.